Consumers can contact HP toll-free at 888-202-4320 from 8 a.m. to 7 p.m. CT Monday through Friday or online at www.HP.com/go/batteryprogram2018 or www.hp.com and click "Recalls" for more information. Laptop Computers, Desktops, Printers and more | HP® Official Site www.hp.com. The product was sold at Best Buy and other stores and authorized dealers nationwide and online at www.Amazon.com, www.hp.com and other websites. The batteries were shipped in notebook computers and mobile workstations sold from December 2015 through December 2017 for between $300 and $4,000. The batteries were also sold separately for between $50 and $90. HP is offering a Battery Program Validation Utility will check if the battery in your notebook computer is affected. Validation using the utility generally takes less than 30 seconds. Click here to be taken to HP Battery Validation Utility tool provided by HP. Many of these batteries are internal to the system, which means they are not customer replaceable. HP is providing battery replacement services by an authorized technician at no cost. HP is also providing a BIOS update that places the battery in "Battery Safety Mode" so that the notebook or workstation can be safely used without the battery by connecting to an HP power adaptor. Batteries affected by this recall should immediately be put into "Battery Safety Mode". 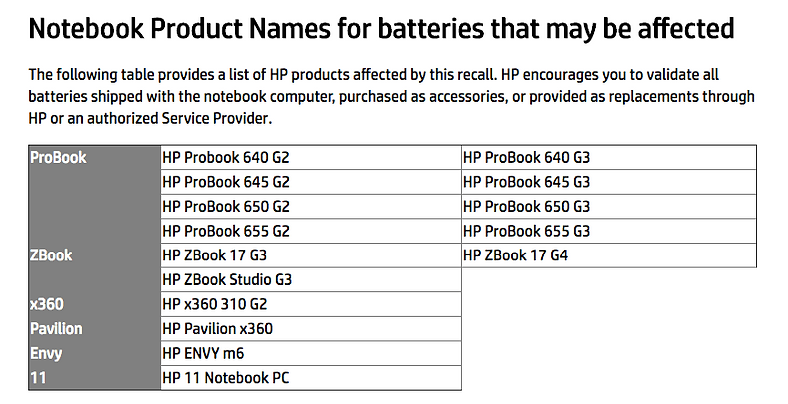 Battery Safety Mode is only applicable to HP products affected by this recall. If the validation process identifies a battery as being eligible for replacement, the BIOS update should be applied and the system should be rebooted. During the reboot process, an option will be presented to enable Battery Safety Mode. Accepting Battery Safety Mode causes the battery to discharge and to cease future charging until Battery Safety Mode is disabled. HP strongly recommends accepting Battery Safety Mode so that the notebook or mobile workstation can be safely used by connecting to an HP power adaptor. For more information please refer to the FAQs tab on this website. HP's primary concern is for the safety of our customers. HP is proactively notifying customers, and will provide replacement battery services for each verified, eligible battery, at no cost. For customers with 5 or more potentially affected batteries, HP has put in place a process to assist with validation and ordering . For details please refer to the FAQs tab on HP's site.